Repair work should only be done by a qualified leaded glass repair person if you want the repair to look and be as structurally sound as the original piece and to preserve the value of the piece. I do very limited repair work because the process is so time consuming and expensive. 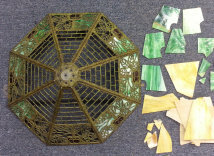 If I can help or advise on the repair of a piece of leaded or stained glass, please contact me. 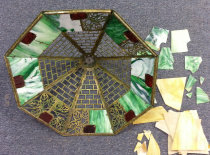 Repairing a broken stained or leaded glass window is certainly not the preferred endeavor of most glass artists. Repair work, especially on an old piece, can be very time consuming, dirty, and potentially hazardous. 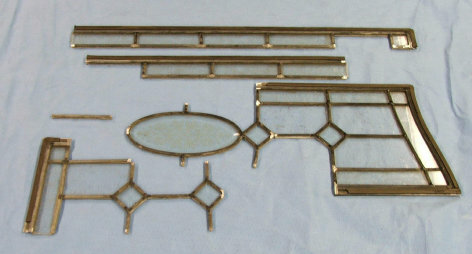 Most often a window has to be removed, partially disassembled, glass cut to fit existing metal work, and then carefully reassembled and soldered. If the piece is old, finding matching glass may be very difficult or impossible. 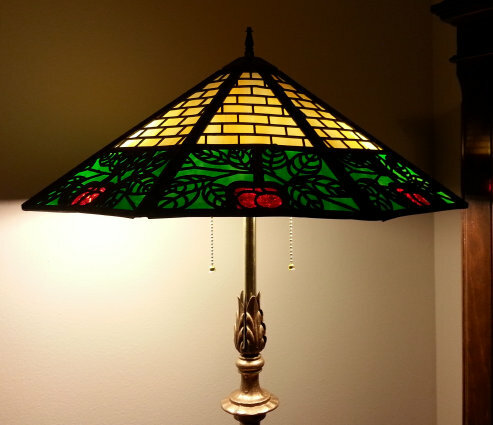 Recently, Beth asked me to repair her damaged Bradley & Hubbard Cherry stained glass floor lamp (circa 1910 - 1920?). 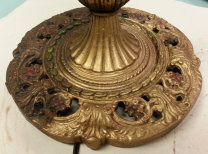 I hate repairs, but this lamp was so beautiful that it deserved my best effort. All the amber glass and half the green glass were replaced, new wiring and sockets added and the brass work refreshed. Isn't this a magnificent lamp?